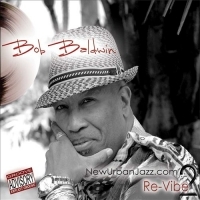 Bob Baldwin - "NewUrbanJazz.com 2 / Re-Vibe"
Fashioned as a sequel to his 2008 set NewUrbanJazz, Re-Vibe continues the veteran keyboardist's exploration (via all original material) of that unique crossroads of old-school soul, modern funk, traditional, and smooth jazz, and even an occasional world rhythm. Between excursions into this territory, Baldwin interjected a few recordings where his primary focus was doing covers that reflected on his soul ancestors, Lookin' Back and, in the wake of his passing, Never Can Say Goodbye: A Tribute to Michael Jackson. On Re-Vibe, he looks back for inspiration but forges ahead, tipping the listener off on the first track as to what they can expect via a spoken word explanation (like a DJ) that is super cool but ultimately superfluous; the music should and does speak for itself. Delving into a bluesy "Uptown Situation," Baldwin funkifies with piano and old-school keyboard sounds, shimmering improvisations, and brassy interludes. "Get Over It" blends his brand of elegant piano funk with chill and groove seasoned with the wistful flute musings of Ragan Whiteside. On "For Grover and George," he pays light-hearted homage to two late sax legends who paved the way for today's urban jazz sound: Grover Washington, Jr. and George Howard. It's a minor nitpick, but in the liner notes, it's wrong to say "Introducing Darren Rahn." Rahn, who carries the muscular sax harmonies admirably, not only had several solo albums prior to this, but had also produced major instrumental projects by Wayman Tisdale, Eric Darius, and Dave Koz. Ah -- maybe that's why Baldwin calls the next track "Unthinkable," a dreamy slice of cool lifted by spacy synth sounds and Joey Sommerville's elegant trumpet and flügelhorn. Along the new journey through the world of NewUrbanJazz, Baldwin also delves into unabashed soul-romance ("All Over You"), blends the sensuous with hip-hop grit on "Get a Little (Jazz in Your Ear," and makes no bones about pushing the grooving envelope beyond radio-friendly on the trippy, old-school, seven-minute meditation "Cosmic-Tology" and the exotic "Arabian Sweets" (with more delightful flute by Whiteside). He gets back to funky, in-the-pocket business on "Burnin' (In My Brain)" and the Jeff Lorber-esque light jam "Re-Vibe." With 14 tracks, Baldwin covers lots of ground and offers something for everyone's urban jazz palate. Nice to see an artist who could so easily rest on his laurels so perfectly fuse the comforts of the past with the adventurous jaunts into the future.